Larry Bird is widely considered one of the best basketball players of all-time. He has furthered his reputation in the game with successful stints as a head coach and team executive. Larry Bird cards have an equally strong reputation in the hobby and, understandably, he is one of the top collected non-active players. Click here to shop for Larry Bird cards and memorabilia on Amazon. 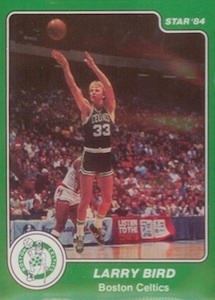 Affectionately known as "the Hick from French Lick" based on his hometown, Bird is synonymous with both the Boston Celtics and the state of Indiana. He enjoyed a terrific career that saw him win three NBA titles. Bird was inducted into the Basketball Hall of Fame in 1998. Bird's relevance even transcends sports, as it was revealed that Twitter named their logo, "Larry the Bird", after him. While all basketball players will be compared, perhaps unfairly, to Michael Jordan, Bird was still responsible for a very significant period of growth in the NBA and basketball collecting. Feeding off his intense rivalry with Magic Johnson that carried over from college, Bird's Celtics and Johnson's Lakers frequently squared off in games that decided the NBA Championship during the 1980s. These two men dominated the early part of the decade, and, in a way, carried the collecting torch until Jordan was ready. Bird and Johnson have also shared space on many cards, starting with their rookies. Unfortunately for Bird collectors, the heyday of his playing career did not coincide with strong basketball collecting interest. Outside of a few select offerings, most Larry Bird cards from the 1980s and early 1990s are worth very little. Bird was not involved in the insert craze of the late 1990s that pushed basketball values way up. He also came well before the time that autograph and relic cards were a regular part of collecting. However, the new millennium has brought renewed interest in Larry Bird. He has been featured in many products with game-used and autographed cards. These post-2000 cards make up the bulk of his collecting value as well as a large portion of the top Larry Bird cards. The following list contains the top ten options for Larry Bird cards. This list aims to honor some of the most highly regarded and collected cards of the Celtics great and not necessarily most valuable. Like other cards that fall into the "Holy Grail" status of the hobby, there is little that needs to be said about this amazing card. Featuring the sole rookie cards for Bird and Magic Johnson, this card would be considered elite with those two alone. But on top of that, it also showcases Dr. J, sandwiched between the two rookies. Three Hall of Famers. Two Rookies. One Card. Enough said. Basketball collecting purists are likely to look down on a card from the Star Company. Despite being the collecting bridge for basketball during the card drought that fell between 1981-82 Topps Basketball and 1986-87 Fleer Basketball, many would consider this product as more of an oddball set than legitimate card brand. This is because of the low print run and limited distribution for Star Company products. Reprints are also an issue. Nonetheless, this card deserves a spot on this list because of its rarity and lack of other mid-80's options. Bird's card is one of several short prints in the set and, easily, the most sought after. 1986-87 Fleer Basketball is an iconic set that put basketball cards back on the map. While Bird may not be the first, second or even tenth most desirable card from the set, the great design and relevance of the product combined with a player of his caliber, makes for an dynamic combination. 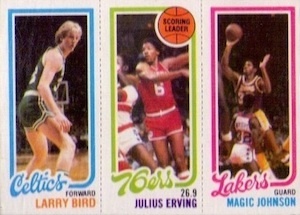 Bird's sticker insert has also remained popular. 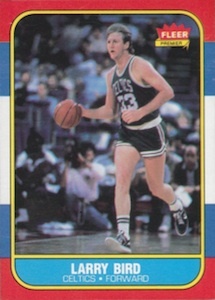 Despite retiring at the end of the 1991-92 season, Bird still managed to be prominently featured in the inaugural Topps Finest basketball product. The base card can be had for a few dollars but the real chase is the Refractor parallel, which have since gone on to be one of the hobby's most popular inserts. At 1:13,896 packs, puling this card was an accomplishment in itself. But the long-term importance of a card that features the signatures of two elite players on one card is nearly impossible to convey. Cards like this didn't exist at the time. Be very careful when buying one of these cards because they are notorious for counterfeit problems. A good clue for an authentic version is a visible Skybox embossed emblem in the center of the card. Unfortunately, this is still no guarantee of authenticity. Also, be aware the card came as a redemption card in 1993-94 Hoops Series 2. They don't get more simple than this. 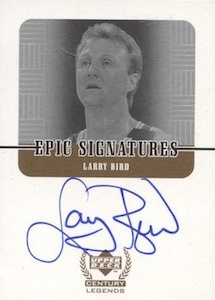 The very first mainstream brand to feature a certified auto of Bird exclusively, Bird's Epic Signature card is a rare and valuable option despite having no serial numbering. At 1:23 packs, the autographs were not even that difficult to pull but the boxes of this popular product quickly dried up and are now hard to find. There is also a Century parallel that is hand numbered to 33. 2002-03 Ultimate Collection Signatures has a nice design and large signature area. However, the base version does not offer enough on its own to make the list. High-end collectors will be interested in the gold parallel that is nearly identical except for being hand numbered to 33. The only other noticeable difference is the "33" in the background of the signature area. The regular version utilizes a silver font while the gold parallel appropriately uses a gold font. Exquisite Collection ushered in a new era of basketball collecting and it took rookies, veterans and retired players along for the ride. Limited Logos emerged as a collector favorite based on their on-card autograph and medium-sized jersey pieces. A small head shot, rainbow foil and black background helped give the card a personality without overshadowing the autograph and jersey piece. Bird's 2004-05 Exquisite Collection Limited Logos card is more rare that the previous year's. This amplified the appealing aspects from 2003-04 to make another winner. The card has a noticeably polished look and includes a larger image of the Celtics legend. The overall design of the card helped incorporate the jersey piece in a more complete look. 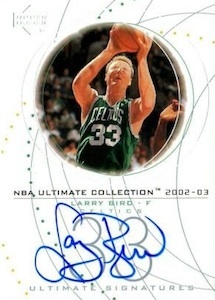 With the influx of autographed cards since 2000, there have been many new and valuable Larry Bird cards for collectors to pursue. There are also many cards that feature Bird paired with other superstars. The 2006-07 Exquisite Collection Dual Enshrinements card showcasing autographs from Bird and Jordan is a great example of that. While it's overly limited print run makes it very difficult to locate, it is still a fantastic card. To the delight of most collectors, it also features Jordan as a member of the Chicago Bulls. 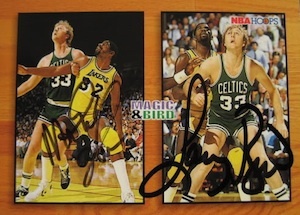 There are quite a few cards featuring the signatures of Bird and Jordan and really you cannot go wrong with any of them. I have a couple lbirds cards, 1 is a Barcelona card and the other is one of him standing next to a guy and has a #1 at the top of the card. 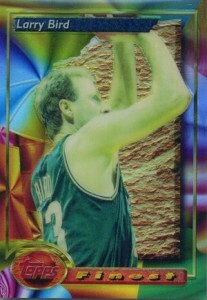 I have a Larry Bird 33 1992 celtics upper deck card for sale. I have a Larry Bird NBA Hoops basketball card on the back it has a no. 150 year 79-80 – 88-89 how much is it worth?